Devialet Phantom Reactor hands-on hands on review | What Hi-Fi? How many people do you know who need a wireless speaker capable of the volume levels of a live rock gig? 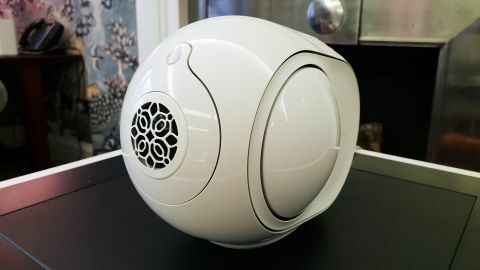 French audio brand Devialet largely distinguishes its three powerhouse Phantom wireless speakers by power output, with the Classic Phantom, Silver Phantom and Gold Phantom all similar in physicality but discernible by different – but all huge – peak powers: 1200 watts, 3000 watts and 4500 watts respectively. Even the former figure would suffice for a disco and is still almost three times more powerful than one of our favourite, similarly-priced premium speakers, the Naim Mu-so. Devialet has just announced its cheapest (£990/€990) and smallest (toaster-sized) wireless speaker yet, hoping the Devialet Phantom Reactor will make the range ‘available to all’. ‘All’ may be a stretch, but it’s certainly going to prick up the ears of those after a compact and streaming-savvy speaker under £1000. Despite its miniature proportions and familiarly-friendly, all-white, Phantom-like appeal, it isn’t called Casper. Devialet has gone with Reactor, which it says explains the speaker’s paradox: ‘unreasonable sound’ from a tiny enclosure that shouldn’t be able to be so powerful. 600 watts is the figure next to the Reactor – more than enough for a typical domestic situation, then – although there’s also a 900-watt variant (£1290) that bridges the gap between the £990 model and the Phantom Classic. So, what's our initial reaction to the Reactor? The baby of the now-four-strong range is one fourth of an adult Phantom in terms of size. Devialet says that everything it learned from Phantom has been applied here - just downsized. That means it uses the company's Analogue Digital Hybrid (ADH) technology (essentially a combination of analogue Class A and digital Class D amplification) that makes the Phantom so unique, but the power supply features a more efficient transformer, allowing Devialet to reduce the size of the electronics inside. Of the 100-plus engineers that worked on Reactor, 20 worked specifically on the new, smaller, built-in-house woofers, too. Unlike its siblings, the Reactor has inconspicuous on-unit touch controls for the likes of volume and Bluetooth pairing. There's now a simplified companion app so you can control playback via Spotify, AirPlay, UPnP and Bluetooth. A 3.5mm/optical combination input allows for a wired connection to a smartphone, portable music player or TV. You can play more than one Reactor in the house via the app, although multi-room zone grouping won’t be available until sometime in 2019. Devialet has said stereo playback – something we almost expect from a wireless speaker of this price and size – will come too, but apparently the software isn’t ready yet. The sealed-boxed Reactor brings with it a small aesthetic update: a one-piece body, so it doesn’t have a split line running through it. Otherwise it’s very much a spitting image of its capsule-shaped siblings. Its sound is no less familiar. At a hotel briefing, we hear a handful of songs over Apple AirPlay, and each lays bare the speaker’s direct, clear and effortlessly room-filling delivery. Indeed, the Reactor’s scale and loudness belies its modest proportions - spookily so, you could say. For some living spaces, the Reactor may still seem over the top. After all, its 98dB volume capability is comparable to the loudness of a drill. We can hardly say we’ve been twelve rounds with it – that'll come later when it goes head-to-head with similarly-priced rivals in our test rooms – but we’ve heard enough to suggest it should be a contender at the money. First up is a jazzy classical track, and the drubbing snare and kick drums make a dramatic entrance, emitting from the Reactor with clarity and impact. The speaker’s bass depth eats up the wicked bass guitar line that opens Rachelle Ferrell’s Sista, which is thick and quick out of the two animated woofers. It bumps along nicely below her vocal, which soars above with scale and – again – heaps of clarity. That notable vocal delivery is demonstrated with George Benson’s The Ghetto, too, his soulful vocal crooning not only direct but attitude-laden, and a good advert for the Reactor’s articulate and warm balance. Devialet clearly wants to expand its reach - something it’s worked hard to do over the years with a presence in Harrods (and now also Selfridges), a former partnership with Apple, and a collaboration with Sky for its Soundbox. Lowering its entry-level price and tapping into an increasingly popular price band seems a good way to make the brand even more accessible. And if the Phantom Reactor succeeds as a class leader, or at least a strong competitor, it could well be the brand’s biggest seller yet. It certainly has the clarity and scale in spades to stand out in the sub-£1000 space, but whether it has the dynamic knack and rhythmic subtlety to truly trouble its rivals is something we’re keen to find out.